This was a collaboration project initiated by Pok Oi Hospital under the New Territories West Cluster of Hospital Authority of Hong Kong. 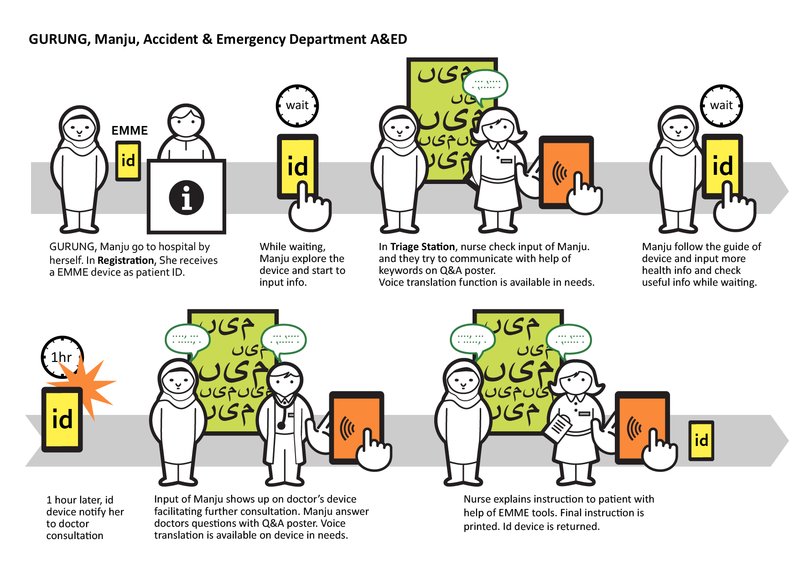 The project aimed to seek for opportunities of improving the service of hospital for ethnic minority groups through interaction design. “Embrace – comforting Medical Experience for Ethnic Minority” developed from initial research and analysis stage, to idea generation and concept execution. By understanding the problems and difficulties faced by the target group, insights were identified and relevant solutions were suggested accordingly. It was expected that this project could serve as a proposal for further development and execution for the benefit of improving the medical care services for Ethnic Minority Group. Patient’s emotion: Nervous, frustration, stress, uneasy, no patient. Sometimes this is caused by not understanding the system. Sometimes it is a general sense of discrimination derived from other occasions. It is important to understand how patients proceed through the care delivery system. The best way to achieve this is through process mapping. 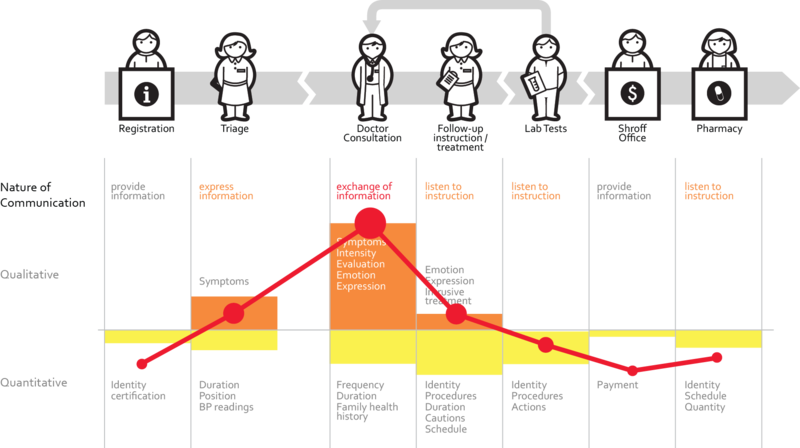 Process maps are an effective way to identify constraints and bottlenecks, and unnecessary process steps. 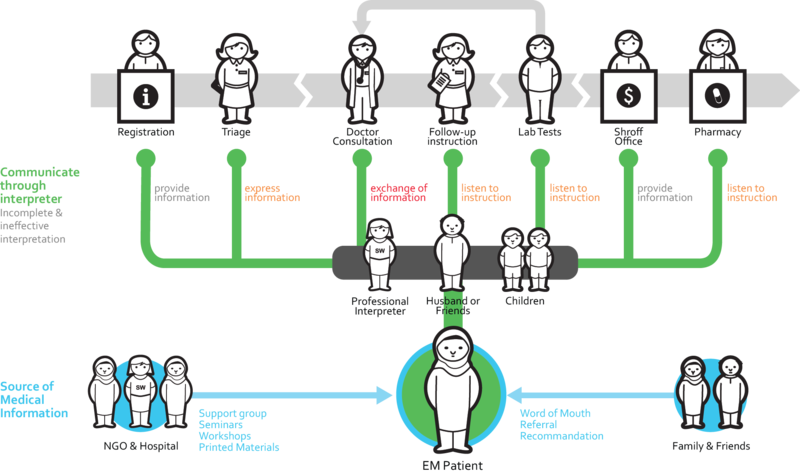 Process mapping is a useful diagnostic tool for determining where problems lie. Understanding the process from the patient perspective is essential if patient focussed service improvements are to be made. 1. Source of Medical Information – either from words of mouth of family and friends or for activities and seminars organized by NGOs. However EM patients may not get update information from local citizens, and they are not keen on reading printed materials. 2. Accompanies during visit to hospital – always accompanied by family members or friends who can speak English and/or Cantonese. They will act as interpreters for the EM ladies. They are very much relied on this indirect communication which sometime may be inaccurate and misunderstanding. 3. Professional Interpreters – If time allows such as patients of Special Out Patient Department, interpretation will be arranged in the expenses of the hospital. But this may not be available in A&ED. There are two main problems in a typical patient journey. It is not uncommon for EM ladies to bring along with their little children to the hospital as their interpreters. However although the small children may be growing up and studying in local school, and they can speak English and even Cantonese, they are usually too small to understand medical conditions and not to mention those complicated medical terms. This may leads to inaccurate translation and severe danger. Also medical instruction is always in Chinese and sometimes in English. There is no native language instruction materials. 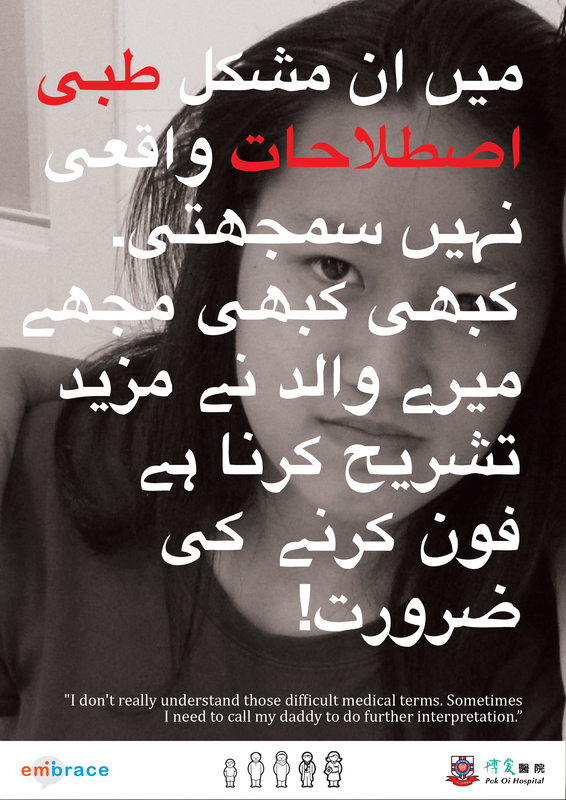 It is very rare to have information and instructions translated in Urdu or Hindi. It would be very difficult for EM patients to remember and review those important instructions and precautions. Furthermore the adult family member to dominate the whole conversation with the doctor and nurse without asking feedbacks from the patient herself as if they knows everything about her health condition. The patient has no clue about what they are talking about her, and the frustration and confusion will accumulate. Also there is a tendency for the doctors and nurses to talk solely to the interpreter instead of the patient. There is case that when the nurse knows one family member can speak Cantonese, she will talk fully in Cantonese about the medical instruction of a lab test disregard the fact that the language level is actually quite low. Different levels of communication are required during the patient journey, from quantitative to qualitative, from pronunciation of their names, to duration and dates, to expression of sickness and evaluation of pain. Stress and anxiety accumulate when the patients cannot express themselves, and could not comprehend the diagnosis about their own health, cannot read instructions, confuse about what practitioners are discussing. Patient will also feel frustrated when they are not sure about what is going to happen in the next step of patient journey. 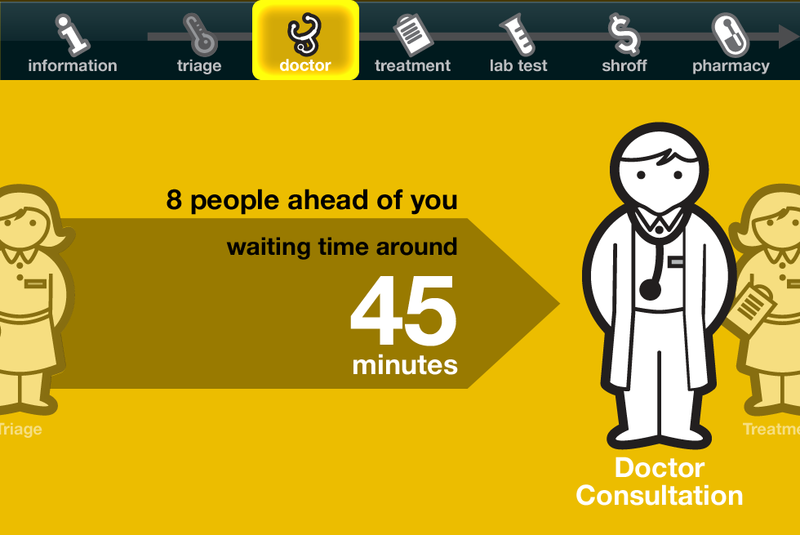 In current patient journey, nearly 2/3 of the time spent in hospital is pure waiting. 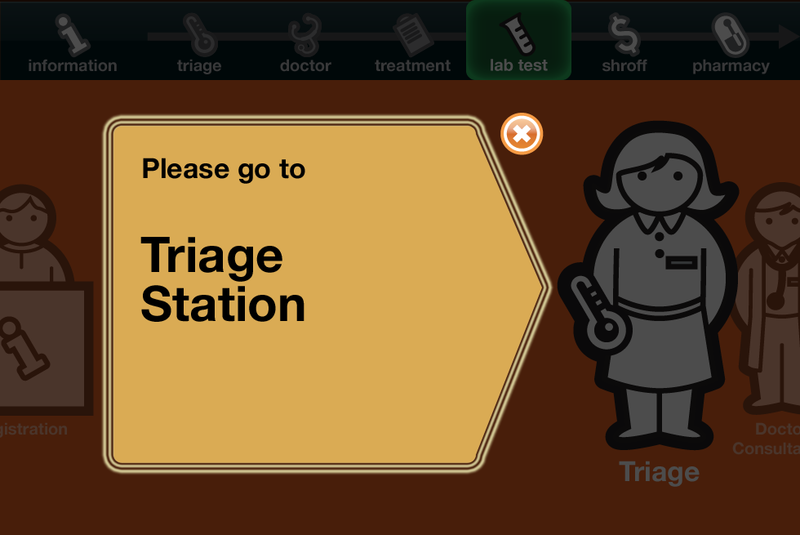 Patients have to wait for preliminary examination in triage station, and then wait for doctor consultation. 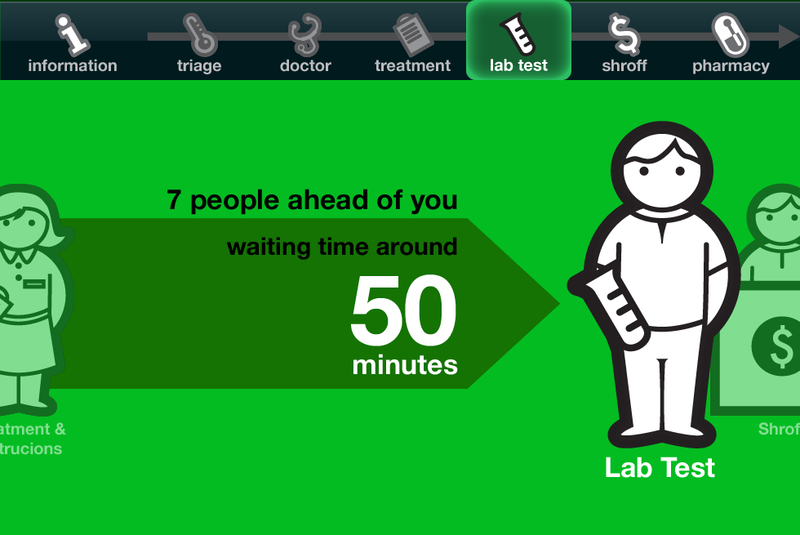 If they need to do lab test before diagnosis, they have to queue up for lab test and wait the result. At last they need to wait for getting their medication. The waiting could last for a few hours, in extreme case a day. In between productive activities are nonproductive waiting hours. Patients has nothing to do for their health. 1. Build confidence for EM patients and let them express. 2. Let the patient take control of the journey. 4. Make use of the waiting time. 5. To create consistent contact point for adherence. This project aims to provide Ethnic Minority patients with comforting Medical Experience. 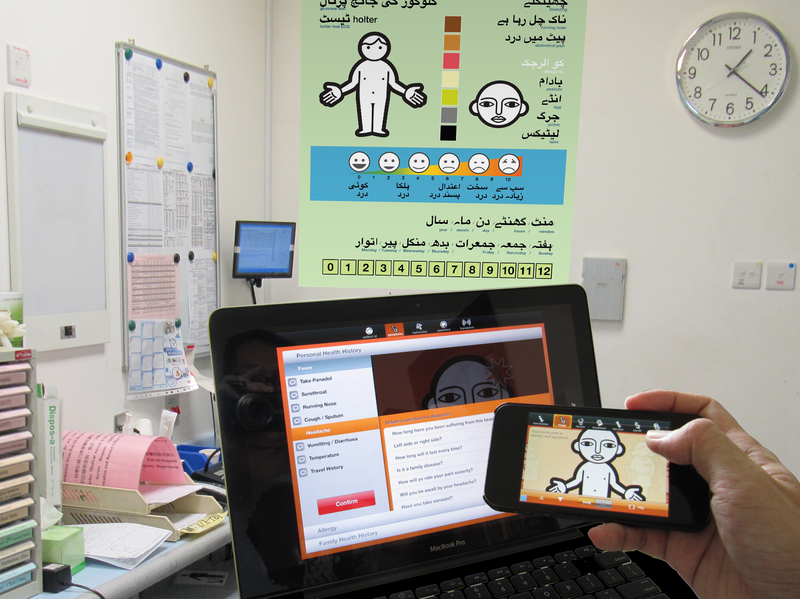 It empowers them with effective tools to communicate their own health condition without relying on interpreters. 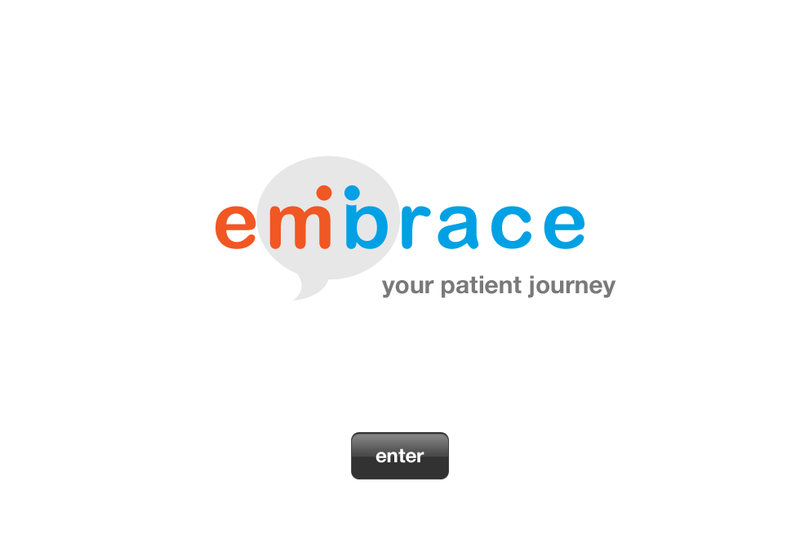 embrace is an innovative communication system consists of digital devices, keyword Q&A aids and graphic posters that allow users to communicate their own health condition without relying on interpreters. The objectives are to overcome language barrier, build confidence for EM patients to express and take control of the journey, to communicate accurate medical information and instruction, to make use of the waiting time, and to create consistent contact point for adherence. 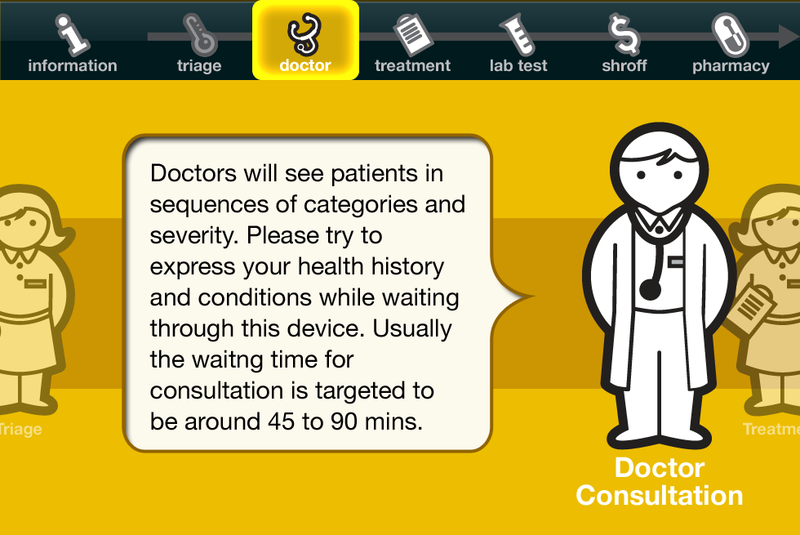 01: embrace patient device user interface design is written with patients’ native language. 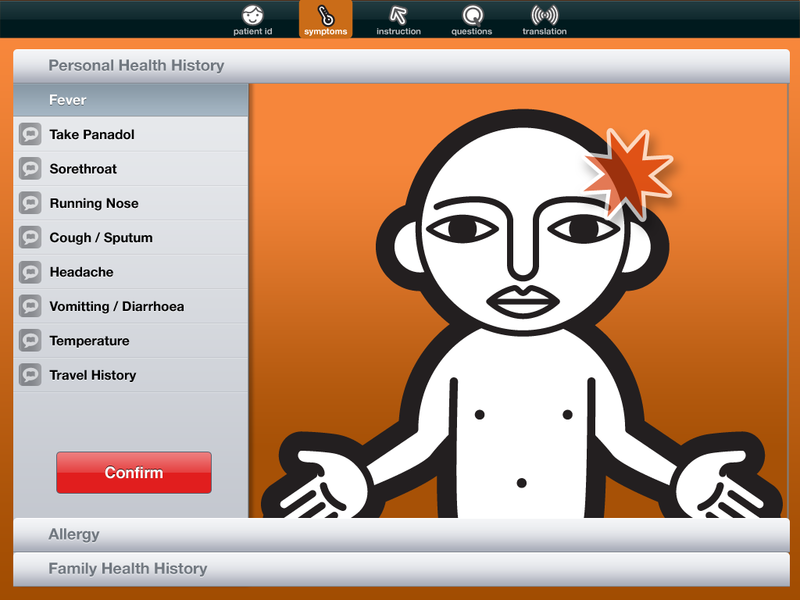 The interface uses metaphor of a patient journey that guide users along the way and input necessary health information. 02: embrace doctor device user interface. 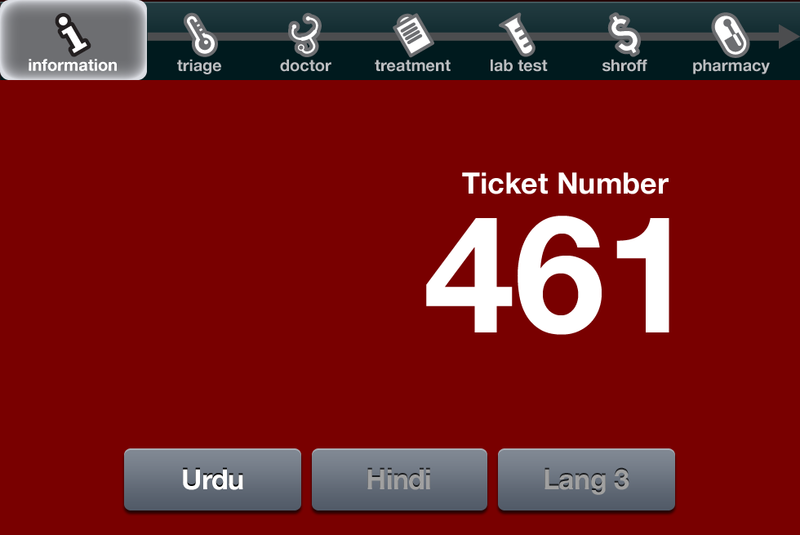 Input of patient is translated automatically into English for the care-givers. 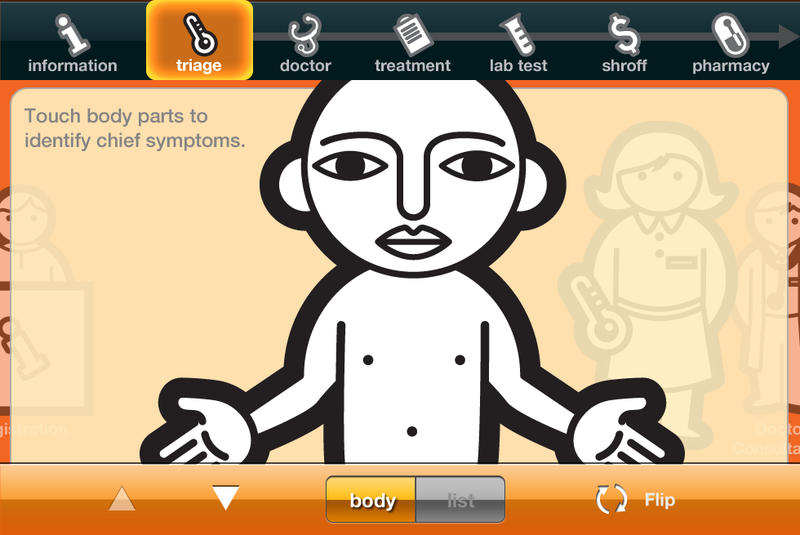 Text speech and voice interpretation function is also available for in-depth diagnosis. 03: Q&A poster consists of keywords of lab-test, allergy, pain scale, numbers, duration and body figure diagrams for basic exchange of health information. 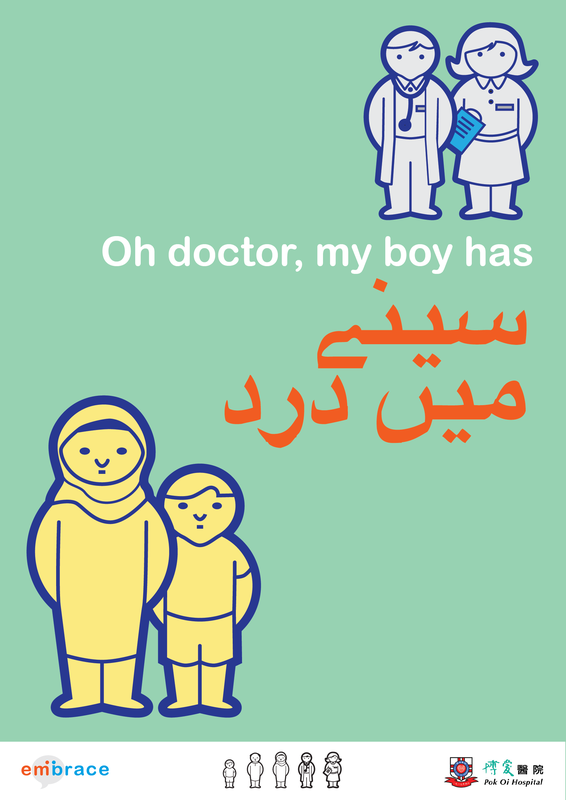 04: Graphic posters present quotes from patients about their concerns and difficulties in their medical experience. This shows the compassion of a caring medical service provider. 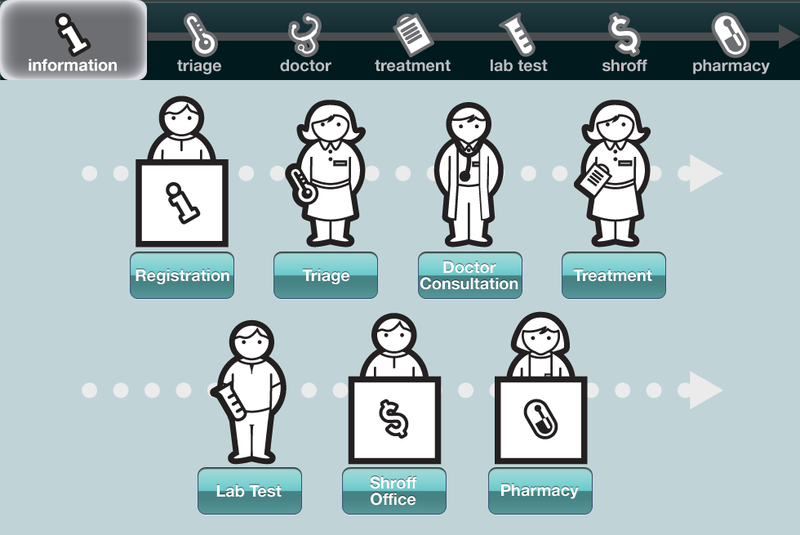 Digital devices use patient journey as the metaphor for user interface design. 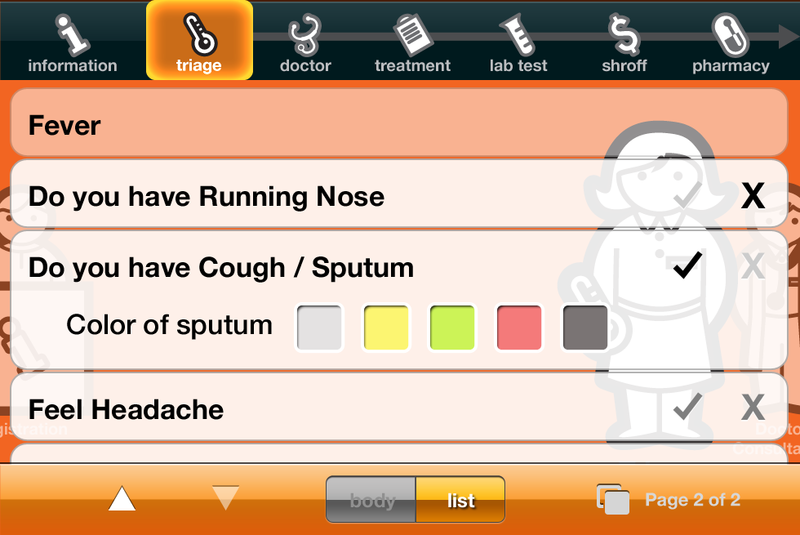 The interface is named after information, triage, consultation, treatment, lab test, shroff and pharmacy. Interface will be in their native language. 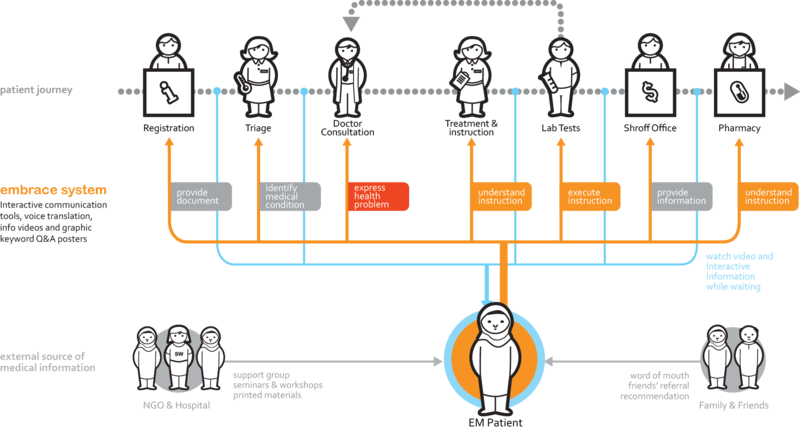 The flow of information map to the actual patient journey which help guiding the input of health information respectively. 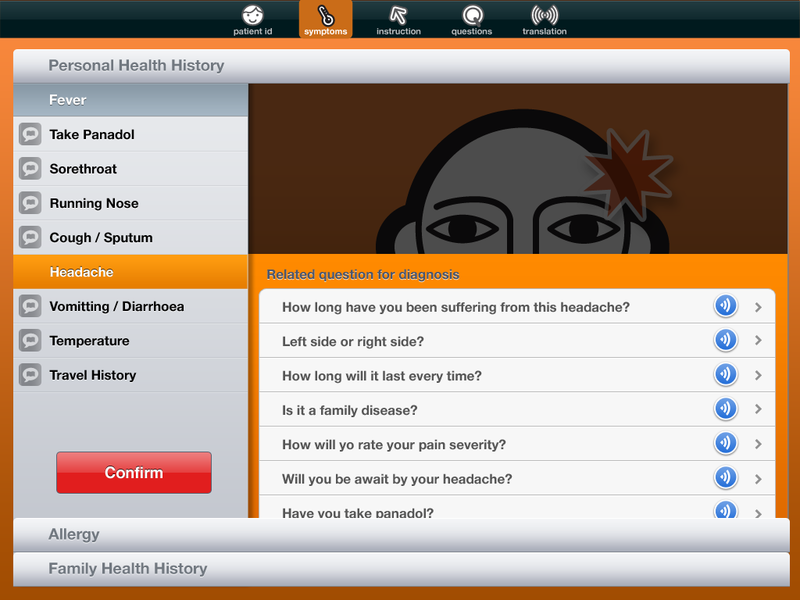 Inputs of patient will upload onto the system, and they will be displayed on doctor’s device in English. Text speech function and voice translation will be available for in-depth conversation. 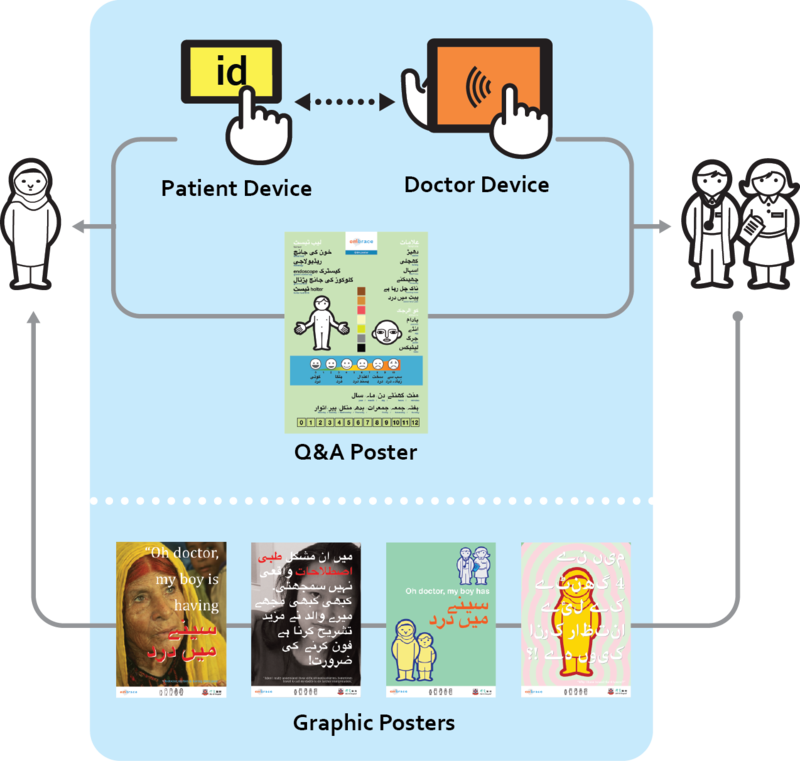 The poster is designed to assist simple Q&A conversation between patient and caregivers. The poster is visually divided into four areas: Allergy, suggested lab tests, pain scale and numeric answers. 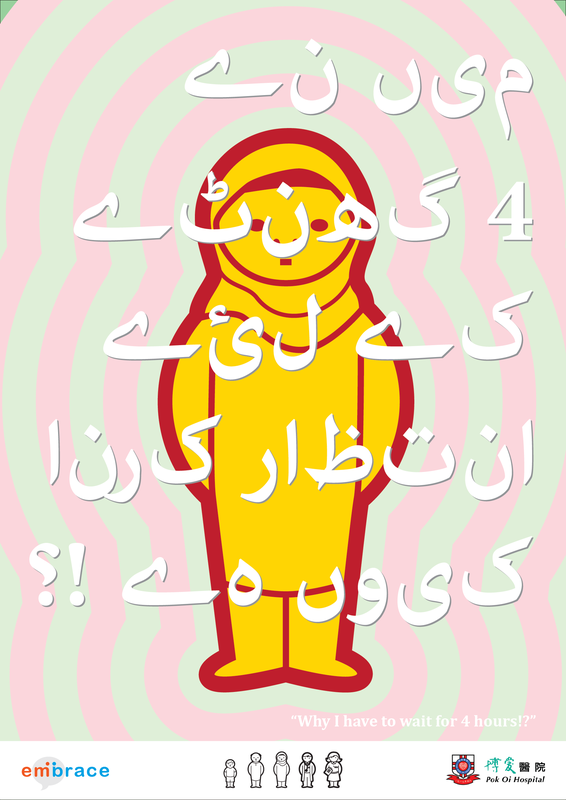 The poster is bilingual with Urdu and English. 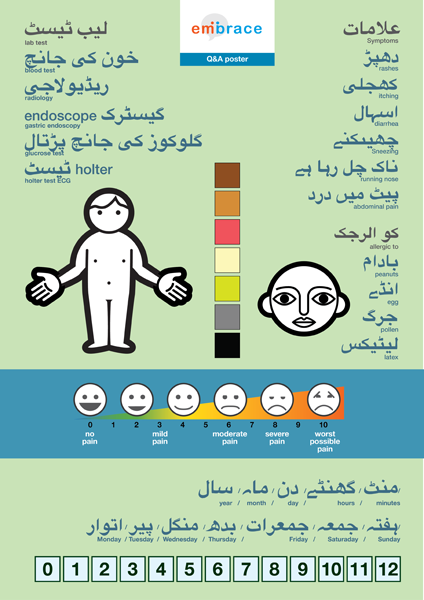 Obviously Urdu words are in larger size for the use of EM patients when words in English is smaller for frequent users such as doctors and nurses. 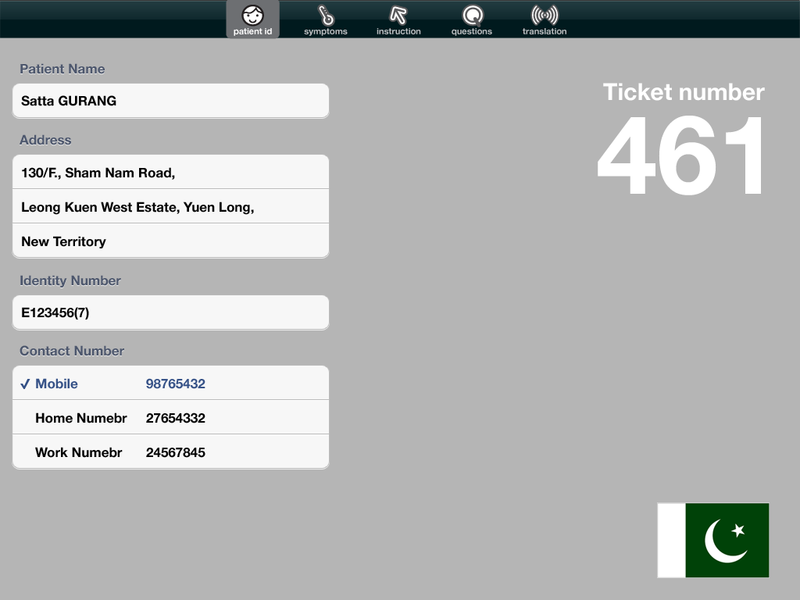 Users can use it for questions and answers by simply pointing to the key words and numbers. Content can be updated easily through editing and reprinting. Posters for different departments may be different depending on the need and requirement. 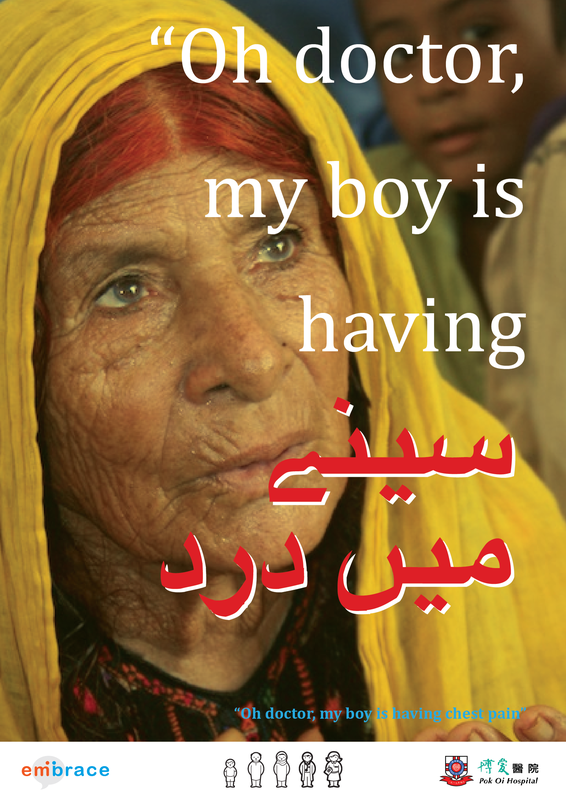 The posters use quotes for EM patients as the theme message. This is a gesture showing the compassion of the hospital for Ethnic Minority Group, and say we understand your feeling, your difficulties and requirements. 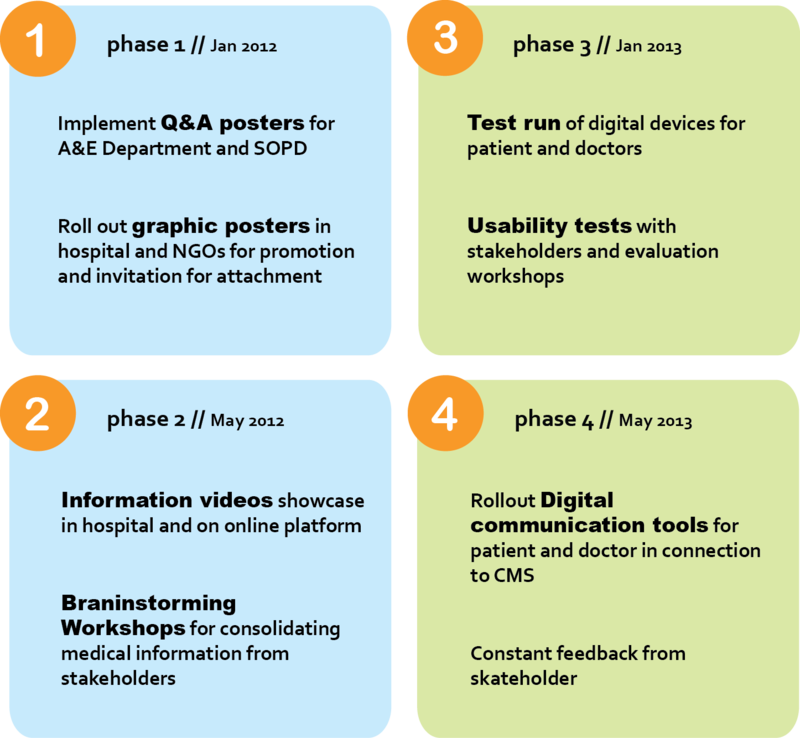 The project solutions were designed based on thorough research and study of current patient journey, and how stakeholders interact with each other in the process. 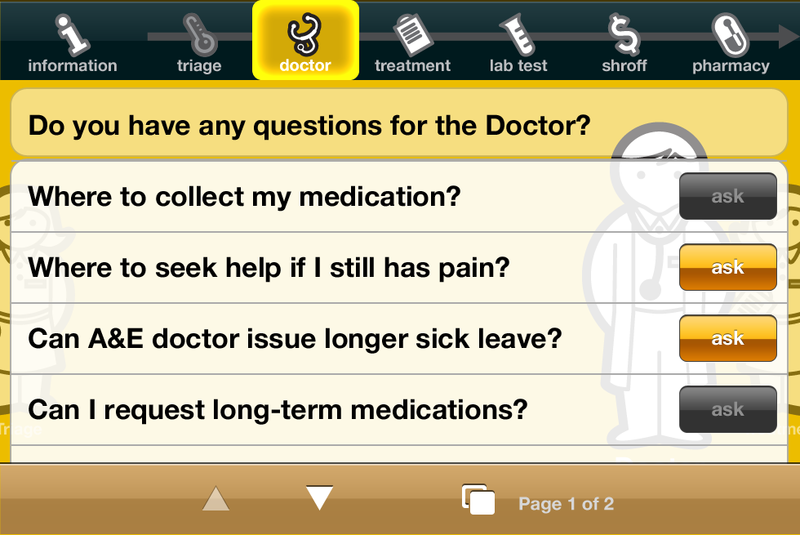 Patients’ difficulties and requirements were observed and analysis in this two months project. With the contribution of frontline medical care professional and management, opportunities are opened in terms of practicality in real hospital context. Also the inputs from social workers and programme coordinators from NGOs help understanding the characteristic and behaviour of the target group. The project focused on providing solutions for the above design opportunities. No fictional technology was employed. User capability was taken into consideration, and the solutions ranged from low-tech graphic posters to mid-tech digital input devices, no more complicated than an ordinary ATM machine. The key features took advantage of back-end translation and voice translation that helped seamless communication. Users did not have to worry about the technology but just enjoy the benefits from it. This was a wonderful design experience. All stakeholders were contributing all they have to the success of the project. The hospital colleagues tried their best to give green lights to my numerous request of observation and shadowing of EM patients, and also gave their time for interviews, discussion and evaluation workshops! Without their generous support, the project could not be as real and solid as it is now. Colleagues from NGOs spent many of their time in organizing activities wth EM people, explaining their characteristics and introducing existing works done catering the specific needs of them. The project began with a bigger scope addressing both language issues as well as cultural concerns of EM patient. 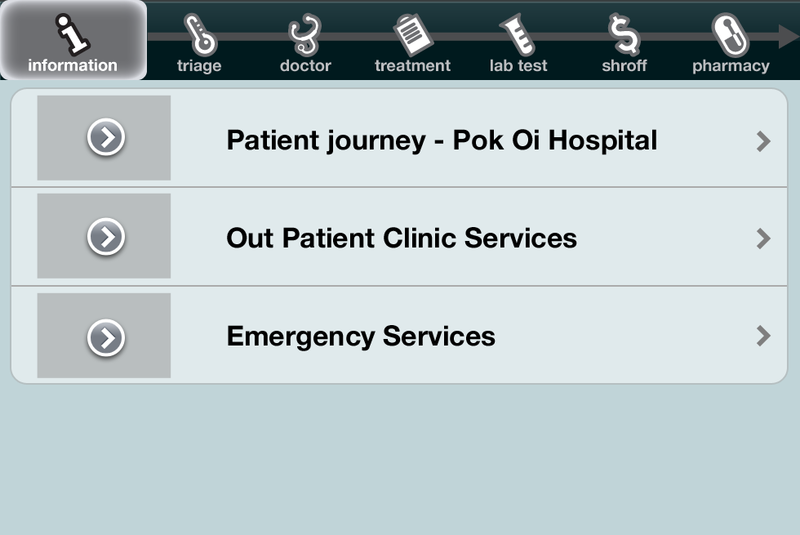 As the project developed, the focus was narrowed down to the actual patient journey in the hospital. This turned the project from a solve-all-problems approach to a project solving a specific design problem, from a social-based project to an interaction design based project. The scope is more manageable for a two-month project, from research to design proposal. Also this addressed to the major issues that really affected the medical experience of Ethnic Minority group. After all the hard work done for this project, I feel satisfied with the final outcome and design solutions. It is the best project I have done in this programme, and thanks for the guidance my project supervisors. My name is Levina. I find your EMBRACE project is so interesting and useful. May I ask more information about that? Can I contact you by email? Thanks. I am an assistant working in the Faculty of Medicine of CUHK and our term came across with your EMBRACE project which we think it’s very good to let our medical students know what resource is available to help them to communicate with the ethnic minorities in their consultation. We would like to show the Q&A poster on our teaching power point in a communication programme. Could you please let us know if that would be fine for you? Thank you very much.